You�re viewing our Sausage Maker curing culture Bactoferm T-SPX (Pediococcus acidilactici and Pediococcus pentosaceus). Use this product for relatively fast acidification. For a pronounced sourly flavor this culture is a perfect choice for your curing products. This culture drops the meat's pH to under 5.0 within 2 days. Ideal for thin meat products like pepperoni. Extra-Fast culture targeted for fermentation temperatures of 80� - 100� F (drying completed at lower temps). Use this culture for products needing up to three weeks for curing. Summary: For extra fast acidification. If a pronounced sourly flavor is desired, you selected this culture wisely. 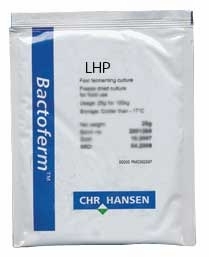 Bactoferm LHP culture causes the meat's pH to drop to under 5.3 in 30 hours or under 5.0 in 2 days. Great for thin products like pepperoni. Extra-Fast culture targeted for fermentation temperatures 90�-105� F. P. acidilactici has optimal growth at 104� F and P. pentosaceus at 95� F, they will grow just fine under this temperature. They metabolize most common sugars and create lactic acid (use Dextrose, not Sugar). Typically this culture is for products that take around 2 weeks or less to fully complete (includes drying).